Making Spaces—On May 6, NWA3D hosted a fundraiser at our North College Avenue shop and office. Four local schools hoping to build new makerspaces through GoFundMe campaigns set up displays of their plans. We provided opportunities for attendees to design and 3D print their own models and to create with 3D printing pens. We also supplied plenty of snacks (thanks, Sherry!). All proceeds from the event were split evenly between the four participating schools: Springdale’s J.O. Kelly Middle School, Bentonville’s Washington Junior High, the Arkansas Arts Academy, and The New School. ScaleUp Ozarks—Startup Junkie launched its fourth installment of ScaleUp Ozarks, a 16-week entrepreneurial education program to help grow existing small businesses and the regional entrepreneurial ecosystem. NWA3D is pleased to be a participant in Cohort 4. The class began in May and runs through mid September. NWA TechFest—NWA3D’s Drew Wallis teamed with James Hopper of the EAST Initiative to speak on STEM education at this one-day “for geeks, by geeks” event at the Fayetteville Town Center. Mini Maker Faire—A free outdoor Mini Maker Faire was held on May 13 along the riverfront in North Little Rock. 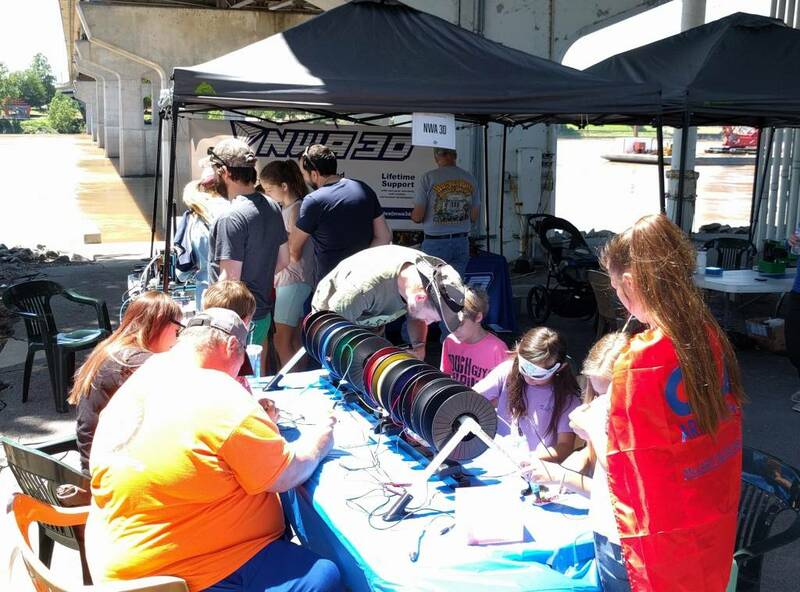 NWA3D joined the fun with an exhibit tent featuring our 3D printers and printing pens. Dozens of kids and teens lined up to use the pen station to create timely Mother’s Day gifts. We bet that the gifts of 3D-printed roses and hearts brought smiles to many moms the next day. Library classes—We visited the public libraries in Elkins and Lincoln, spending several hours teaching students how to design in Tinkercad and print their creations on our 3D printers. Explore and Discover Workshop—On May 20, AETN’s Arkansas STEM Girls program partnered with the NWA Fab Lab to host a workshop for 20 middle school girls. NWA3D’s Drew Wallis joined Eugene Sargent and Tiffany Dixon of the Fab Lab to teach 3D printing, laser cutting and engraving, and Arduino electronics programming. Participants created custom programmed light boxes in the six-hour workshop. Trail Cleanup—NWA3D volunteered to maintain two sections of trail in Northwest Arkansas: one on the Razorback Greenway and one on the Mud Creek Trail. On Sunday, May 28, we organized our first trail cleanup. The number of volunteers totaled 10 adults and one child. We walked the trails and the adjoining sections of recently—and frequently—flooded Scull Creek and Mud Creek. We collected 14 bags of trash! We’ll be organizing future trail cleanups, and we’ll be sure to post about them.